(Fond du Lac, Wis.) March 11, 2015 – Quicksilver Powersports Lubricants will help power seven-time land speed record holder Valerie Thompson on her quest to reach new record speeds at SCTA (Southern California Timing Association), ECTA (East Coast Timing Association) and USFRA (Utah Salt Flats Racing Association) events. Thompson, known as “America’s Queen of Speed,” will use Quicksilver Lubricants exclusively in her specially prepared BMW S 1000 RR land speed motorcycles at every event on her 2015 racing calendar. 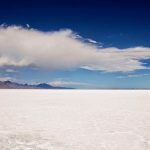 Noteworthy events include the Ohio Mile, Bonneville Speed Week and the World Finals at the Bonneville Salt Flats. Thompson will kick off her 2015 land speed racing efforts March 27 at The Texas Mile event. The Texas Mile is a premier biannual motorsports festival and Land Speed Racing venue that draws the fastest vehicles from all corners of North America in much the same way the legendary Bonneville course draw the world’s fastest vehicles. For more information visit www.quicksilver-products.com. 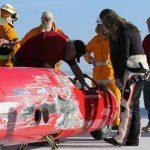 Valerie Thompson, often referred to as “America’s Queen of Speed,” is a seven-time motorcycle land-speed record holder and owner/driver for the Valerie Thompson Land Speed Racing Team. In addition to many accomplishments in land speed-racing, she has competed in the All Harley Drag Racing Association and National Hot Rod Association drag racing series. 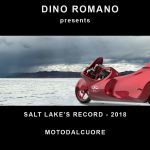 She set a personal best top speed of 217 mph (350.53 KM/H) on her CTEK sponsored BMW S 1000 RR during the October 2014 Texas Mile land speed competition. Thompson is also an official member of the BUB Speed Trials 201 MPH Club, Mojave Magnum 200 MPH Club, Texas Mile 200 MPH Club, ECTA 200 MPH Club and a lifetime member of the prestigious Bonneville 200 MPH Club. Quicksilver Powersports Lubricants, CTEK Battery Charger, HP Race Parts, TROON Enterprises, Magic Bullet Advanced Fuel Treatment, NPmoto Wear Products, Metro Auto Auction, Akrapovič Exhaust, Speed-Way Shelters, Forma Boots, Schuberth Helmet, alpha Performance USA, Champion Systems, ARP, Worldwide Bearings, Stand-Up Photos, Vision Wheel, Go AZ Motorcycles, Bullseye Leveling and Sena Technologies. Since 1950, discriminating customers in the marine and powersports industries have depended on the Quicksilver brand for their parts, accessory, and engine care product needs. Quicksilver Powersports Lubricants are engineered to meet and exceed OEM (Original Equipment Manufacturer) testing standards just like the industry leading Quicksilver Marine Lubricants. In addition, all Quicksilver Powersports lubricants are full synthetic formulas that maximize protection in all applications. Look for the Motorcycle, ATV/UTV, V-Twin Motorcycle, Personal Watercraft and Snowmobile product lines at Wal-Mart and other major retail locations near you. Quicksilver motorcycle oils are formulated specifically to address these demands, with full synthetic, wet clutch-compatible formulas that provide outstanding high-temperature protection, excellent shear stability, enhanced corrosion protection, and lower volatility that reduce oil consumption.